Dauntless Racing had a successful test day at Thunderhill Raceway in California evaluating their new CSR bodywork on a Ralt RT-40/41 Formula Atlantic chassis. The usual initial bugs were worked out, then the team proceeded to do preliminary tuning of the chassis and aerodynamic setups. By the end of the day the Clayton family had the car down to record breaking lap times. Rennie Clayton, the son and team driver, reports, "We had a very successful shakedown run today at Thunderhill to work out teething troubles. We were unable to make the SCCA Regional race last weekend, but made it to the track today running with NCRC / TracQuest in their Open group (think ITE). Not going to release any lap times, but suffice it to say that if we'd been running at the SCCA weekend, there would be a new CSR track record (possibly outright, I'd need to check). We were running the same Hoosier tyres that I won the 2003 Formula Atlantic National Championship on - literally the same set, from 4 years ago. As expected, there were a few mechanical gremlins to work out, but nothing that caused us to miss any sessions. A great deal was learned about the behaviour of the car with the new body kit, as well as how it all integrates together. I can safely say at this point: It is fast." Proud father Stan Clayton added, "I too had a great time at the track today, and it was awesome to get the Ralt back on track after a 4-year hiatus. The NCRC folks were very friendly and welcoming -- a big thank you for sharing the track with us! All the drivers in the Open group were very professional (half the cars sported SCCA stickers... :D ) with lots of point-by's and good, heads-up driving. As Rennie notes, there were a few mechanical issues to deal with. I think the punch list has about 10 items on it, though nothing major. The engine ran like a top, and the new bodywork seems to really work well. We started off very conservatively, as this is our prototype bodywork and we didn't want to damage it. You can see in the photo that the car was quite high (about half an inch higher than in FA trim). As the day wore on we continued to lower the car (almost to FA ride height now) and fine-tune the aero package. All in all, I must say that I am quite pleased with our progress. Sorry about being a bit cagey about the details, but we are not yet at our final configuration and don't want to give away too many details too early. After all, we don't want to give our competition at the Runoffs too much to go on...!" Jay Messenger, long time Sports 2000 racer, announced plans to build a DSR/CSR car. The basis of the chassis will be a 1998 Tatuus Formula Continental (pictured to the right). Current plans are to power the car with a George Dean built 2007 Suzuki GSXR engine, & cover the entire assembly with Dauntless Racing bodywork. Jay says that the Messenger SR will be based on a 1998 Tatuus FC "highly developed and modified from its original state. It ran at the 2006 runoffs and had a fastest lap of the week at 1.40.479 in qualifying." "As far as final drive/engine bay mods I am teaming up with Mike Alexander of PDG Racing Technologies in Austin, Texas (512)431-7400. Mike is a Professional Engineer with 30+ years experience in SCCA with an emphasis in CSR/DSR. Mike will be testing the torsional rigidity of the Tatuus chassis and the related computer modeling as he adapts his chain drive design to the unique Tatuus chassis." Jay adds, "While not final, I am currently working with Rennie Clayton to develop a unique version of the Dauntless bodywork (unveiled in March 2007) that will incorporate the Tatuus nose, cockpit and low rise tail section." "I will look at doing some additional conversions for any '98 or newer VD, or any '97 or newer Tatuus chassis. The designs, engineering and concepts will be very readily adapted to any of these chassis. If someone is out there with an interest in one, they should contact me directly with questions, comments, or suggestions. I look forward to joining the XSR community!" Fusion Racing recently completed testing of their completed FCR06 chassis. The car was run on a large autocross style parking lot course, but speeds still achieved the heart pumping range. "Our body is undergoing some changes but should be ready in time for us to finally race the car at the end of this month. Our first race should be up here in British Columbia, Canada, at Mission Raceway Park on the April 28th weekend", reports Dennis Bainbridge of Fusion Racing. Fusion Racing will offer 3 engine choices in the FCR06. Dennis explains that, "We will be concentrating on the Kawasaki ZX-14 engine for the first month or 2, but we have access to the Mazdaspeed 2.0 & 2.3 liter engines as soon as we are ready." There are currently two great videos of the test session on the Images & Videos page of the Fusion Racing website. 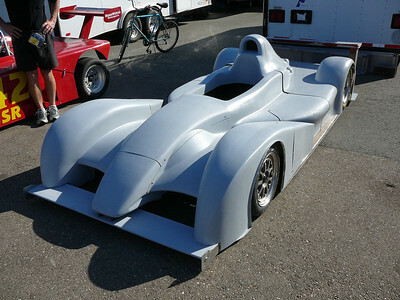 Dauntless Racing brought fresh fiberglass to the Thunderhill, CA, National races to show off their handy work. The P2007.d envelope which was previously referred to as the Clayton bodywork, covered a first generation Stohr DSR chassis. The bodywork started with a set of full length tunnels patterned after those from a Ralt Formula Atlantic car, which were then modified to accommodate the sports racer underbody rules. Dauntless Racing consists of Rennie and Stan Clayton, along with authorized reseller Kevin Mitz. While the group still has a lot of work ahead, they have made huge progress for the "total engineering effort" and garage fabrication work. Rennie said, "After pulling pieces out of the moulds and doing the very basic prototype fitment, we managed to throw a bit of primer on it right at the last minute [the prior night] before taking it out to the track and putting it on display. Dauntless plans to sell the P2007.d as a retrofit kit for first generation Stohr cars, and make it available for owners of other DSRs to customize for their chassis. They are also working on a widened and stretched P2007.c Ralt RT-40/41 version of the body for CSR cars, modeling it on the Clayton's Ralt Formula Atlantic chassis (shown in progress below). "That bodywork will make its debut later in the year." Rennie explains, "The bodywork for the Ralt is much more modular because there is so much more room to work with on the Atlantics. If you're installing this body to an Atlantic chassis, your original tunnels can be retained (with a leading edge extension to keep you legal within the 45% undertray rule), and part of our kit will include a set of flat honeycomb sandwich panels to extend the horizontal lip of your tunnels out to the side of the car. You can see the fenders & sidepod sitting on our prototype fiberglass / honeycomb panels here in this shot where we are doing the cutting & sectioning fitment to the Ralt. The full undertray and all of the mechanical bits, exhaust, radiators, hoses, etc., have been installed to the car for doing fitment. As you can see, there are no vertical clearance issues with the tunnels at the rear of the bodywork (the tunnel exits on our Stohr bodywork are the same dimensions as an Atlantic, so there were no modifications needed there). In fact, the reason we needed to raise the bodywork at all was to fit the Ralt radiator height and those massive rear tyres. Production costs are not yet finalized, but we are confident we will be able to offer very complete kits (including hardware) for prices below those of current Stohr/West bodyworks costs." Kevin Allen took the team's newly developed Mallen Alley PP1 car through its paces at Roebling Road in Savannah Georgia and finish the two day test with a huge smile. No major problems were encountered, so the team now is looking forward to getting out again after they resolve a couple of driver compartment issues. “Roebling Road in Savannah Georgia is a great club course that features a high average speed and very nice new paving. We planned to do a couple easy sessions Saturday afternoon followed by lots of inspecting and prodding to see if anything important was going askew. As it happened, everything was perfectly fine, the only issue was a lack of stiffness out on the ends of our splitter. We were able to cross brace it with a couple aircraft cables and get through the test with no further problems. A fix is in for it, so it will cause us grief no more. I didn't do enough laps to tell much about the car except that it gripped like velcro, it seems the aero is working pretty well. Also that my seat and pedal layout were absolutely hideous. One of our last projects was to foam a seat in place which was done Friday evening at about 11 o'clock. It felt OK until, the car started generating it's pretty substantial side forces, it then became pretty much miserable. I could not find a way to confidently left foot brake as the brake and throttle were too close together. This would not have been too bad but it also made me very slow and deliberate with my footwork. As I would find out the next day, this wastes lots of time in a car with this kind of lateral acceleration. Sunday started out a bit soggier than we had hoped, a cold front blew through overnight and brought rain, cold air and wind, ... lots of wind. By the afternoon it was probably 20+ mph steady with higher gusts, the poor little R1 engine felt broken as soon as I'd make the turn onto the front straight as the wind was blowing straight up it. The engine would pull about 10400rpm during my easy laps Sat, today it was working hard to get 9500. I was actually worried that it was sick but it ran fine the rest of the way around, guess that's what happens when you have less than 100 ft/lbs of torque. The weather issue aside, the car was brilliant, I have never driven anything that would generate the side loads that this car does, even with our limited setup and fiddling. Our goal for the weekend was to see if the wheels and other substantial bits would stay on so we didn't spend a lot of time with tuning. As it happens it was pretty darn good right out of the box so it saved us the trouble of having to scramble for a setup we could test with. or the [ Mallen Alley Racing website ]. Stan Clayton displayed and described the most recent progress on his and Rennie's project to make thier own version of bodywork for the first generation Stohr chassis. Stan Clayton reported, "here is what our buck looked like after being sanded to 220, then primered and painted (gloss black), followed by buffing out. The surface was like a mirror. BTW, a paint-n-body shop did the final primering, painting and buffing out in two days for $260, plus $27 in fees, for a total of $287. See the Clayton Bodywork page. With a price starting at $25,490, the XTR2 offers a low cost alternative to Radical as "a new generation of minimalist, ultra-modern sports cars to bring ultimate high performance track driving to all enthusiasts, not just those with big bank balances. The chassis design, layout and accessibility of all the components and the removable bodywork make essential maintenance part of the fun." Tom McClintock of Manik Technologies LLC, the US inporter of the XTR2, says "We are very excited that the Westfield XTR2 kit is now available in the US at a starting price of $25,490, plus the cost of freight from New Jersey to your location. The above kit price includes custom crating, and trans-Atlantic shipping from Westfield's factory to the port in New Jersey (including all import duties, fees and insurance)." While the XTR2 is not yet homologated with the SCCA, nor any other groups, it can be configured to be street legal in many states, theoretically allowing owners to driver the car to the race track, enjoy a thrilling trackday, then return home again on city streets. Westfield has designed the XTR2 specifically to utilize the Suzuki GSX1300R superbike engine and gearbox, also known as the Hayabusa. This is from a motorcycle introduced by Suzuki in 1999. It has a 1299 cc inline-4 engine rated 175 bhp, and a 6-speed sequential constant-mesh gearbox. The weight of the XTR2 is claimed to be 903 pounds in race trim. The car can be purchased as an assemble-it-yourself kit, or as a factory assembled roller. Either choice is ready for the customer supplied Hayabusa engine. 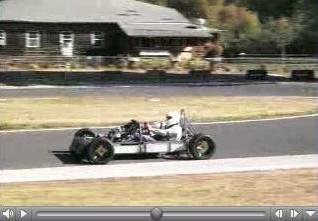 See the Westfield Chassis page. West Race Cars will announce their new LMR chassis next week at the Performance Racing Industry show in Florida. The car can be configured for CSR or DSR classification, depending upon engine selection. The new car will be available for delivery Spring 2007, with final pricing to be announced later. The car can be configured for CSR with a crate Kawasaki ZX14 (dry-sumped) or as a DSR with West's latest generation tunnel floors. Crate ZX10 motors are available for the DSR or they will supply motor mounts for other 1 litre engines of the customer's choice. See the West Chassis page. Mark Johnson of ADR Motorsports North America announced that the ADR3 was recently homologated by SCCA for the ASR & CSR classes. Mark also reported that, "We just completed 3 days of testing and ... the car was well balanced and quick." Mark said that, "while the car was well balanced and quick, it just didn't seem as fast as should be. Well, it turns out that our map was not quite right. We were off 60hp at 6000rpm, and 80 at redline. After loading the new map, the motor sounds great, real crisp. Can't wait for the next test day." The first US based ADR3 was powered by a 1507cc fuel injected Suzuki Hayabusa motorcycle engine (250 bhp) and was driven at track days and some in SCCA and NASA racing events. The ADR3 is a completely new car from its predecessor, the ADR Sport 2. The ADR engineering staff has designed a new chassis, windtunnel tested body, and a host of other items to improve the cars performance, reliability, and ease of service. 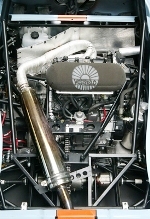 A dry sumped 2.0 liter Honda K20A VTEC engine (250+ bhp) powered car with a Hewland FTR sequential gearbox is also offered as an engine choice for CSR/ASR. Designed and built by Guy Ligier and the Martini company he bought in 2004, the JS49 is aimed squarely at the rapidly growing band of amateur racers in series such as SCCA C Sports Racer. The new car features an Aluminium monocoque, wishbone suspension, a Sadev 6 speed sequential gearbox and is propelled by a dry sumped 240bhp two litre Honda VTEC engine on Magnetti Marelli management. Steve Shelton Jr. also stated that, "The first and subsequently the second car will come with a 2.4 liter Honda automotive engine." Mike Sirianni tested his new car at Beaver Run and was with in a couple of seconds of his previous best time. This was accomplished while breaking in an engine and not reving it over 9,000 RPMs. Sirianni 's crew chief, Michael Devins, reported that "Overall impressions of the car were very favorable. Mike did a 59 flat with no chassis tuning except for one spring change at the rear while the track was cold (mid 50's), and while still breaking in the new motor. The LSR Prince took 2 years of development to get to a 57 in perfect conditions." After the third session, Mike got a call from home and had a family emergency. The practice session was cut short. Because of the limited testing time and the family issues, Mike decided not try to take the new car to the 2006 Runoffs. Racing Concepts LLC now have displayed their revised car which is being offered as a 2007 model, the Speads RS07A. The new car features "substantially revised aero package." The rolling chassis is designed to take any type or capacity of motorcycle engine. The RS07A is a new car for DSR and CSR racing in the SCCA. As with previous models, the RS07A will accept most any motorcycle engine/transmission and retains the immensely strong tubular chassis for ease of maintenance and repair. The new design preserves the strength of chassis and mechanical grip present in the earlier models and adds a substantially revised aero package, designed by noted aerodynamicist Paul Haas, consisting of revised floor, twin diffusers (tunnels) and revised bodywork. Mechanically, revisions include revised suspension geometry, adjustable pushrods, larger foot box, and floating brake rotors with radial mount wildwood calipers. The braking, in a word, is fantastic. Dennis Palatov, who took a first drive out of the shop earlier last week, tested his dpcars dp1 at a local kart track and shared video. This was the first real shakedown of the car without bodywork, just to check everything out. or visit the dpcars dp1 test log. Alan Mertens of Galmer Inc. has entered into an agreement with Cobra International Company Ltd. to manufacture the newly designed Galmer D-Sports Race car. The D-Sports Race car will built by Cobra in Chonburi, Thailand, and marketed under the Galmer Name. The car is expected to be ready by early 2007. "This car is vastly improved from the earlier version manufactured by Merloy Racing and will have new features not available on the previous version. The car is simpler and lighter with new front and rear underbody aerodynamics along with new body design features not previously seen before. Build quality will be constantly supervised in Thailand by qualified International Engineers and Technicians. Expect the car to be ready by early 2007." Galmer, a name synonymous with CART competition (CART PPG World Championships 1990) and the Indianapolis 500 (Indianapolis 500 Winners 1992) through 1988 to 2001, will be used as the moniker for Cobra International’s Arbitrage GT and the DSR or D-Sports Race Car, both being manufactured by Cobra International. Alan Mertens, lead Engineer of the Galmer Arbitrage GT project, was awarded the Louis Schwitzer Award by the Indiana Section of the Society of Automotive Engineers for his design of the Galmer G92 Indy Car Chassis. The award recognizes excellence and innovation in race car design and development. This car went on to win the prestigious USA Indianapolis 500 with Al Unser Jr. and Danny Sullivan as drivers the same year. With March Engineering (as technical Director) and Galmer Engineering (President/Technical Director), Alan Mertens has been responsible for 74 Indy Car wins, including 6 at the USA Indianapolis 500. After four and a half years since his project began, Dennis Palatov drove his own creation today. Starting from mere sketches and a clear concept in his head, Dennis laid out plans to design his dream car then build it from the ground up. 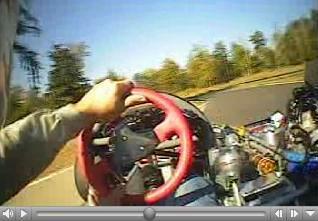 A small, lightweight street/track car, powered by a motorcycle engine driving all four wheels. But of course too much is never enough, and I got the desire to take it further. To combine the best attributes of all my fun machines, and take it up a notch. Or two. It quickly became clear that I had to do my own car. It would be powered by a Hayabusa engine, of course, and use its 6-speed sequential gearbox. And it had to be smaller and lighter than the Westfield, while retaining the ability to be driven on the street on occasion. 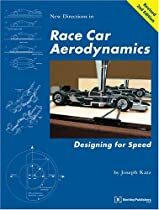 I've looked around and done some comparisons, and realized that a target weight of 700 lbs should be within reach if I make it a single-seater." Dennis related that, "As such things often go, at some point I suddenly and clearly visualized what the layout would look like: a scaled-up version of a shifter kart with engine beside the driver and a driveshaft running forward and back in a central backbone chassis." Dennis chronicled the development of his Solid Works CAD design from the beginning, and shared it with the world via his Log of the Initial Design Phase. Many viewers and readers asked questions and offered ideas and advise along the way. Dennis later created a second Log for the Build Phase of the project, after the bodywork was completed. or visit the dpcars website. Fusion Racing showed their FRC-06 which will be sold configured for CSR and DSR racing, as well as trackday events. The most significant design element of the car is its enclosed top "Grand Am-like" canopy. construction technology comply with SCCA regulations. Low weight, stock motorcycle drive train and off-theshelf parts yield a unique combination of high performance with economy, making the car affordable to purchase and operate." "We made the concept decision that the new car would have an enclosed cockpit in addition to well design crush zones. One only has to look as far as the Rolex series to validate the increased safety of the enclosed chassis." room for both Motorcycle engine/Quaife LSD or Automotive engine/transaxle combinations." The CSR motorcycle engine will be the awesome new Kawasaki ZX-14R, while the DSR will be powered by the Kawasaki ZX-10R (175HP). Fuel injected, naturally aspirated. Stock integral 6-speed sequential gearbox and racing clutch. Both will transfer their power the rear wheels via a Quaife gear driven limited slip torque biasing differential with reverse (designed for Fusion)." There is also the option of having the CSR powered by an 200+ HP automotive engine with Hewland s-speed FTR transaxle. "Utilizing software that analyzed all key segments of cornering, 2 months and hundreds of tweaks later [our engineer, Titus Midgley,] had a design that had less than .3 of a degree of camber change and a roll center that moved less than 25 thousands of an inch over the full range of suspension travel." "It has been the better part of 10 months since we first announced our intentions with that small blurb in the [February 2006] SCCA buyer’s guide. In hindsight, it was probably a little premature to say anything but it was either jump in back then or wait another year, and we were confident the car would be on the track before the next buyers guide issue." More images and specification are available on the Fusion Chassis page. Kevin Allen has created a dedicated internet site for the Personal Prototype 1, which is currently under development. The site shares how Kevin and Adam Malley came up with the idea of designing and building their own sports racers for DSR, and chronicals the build as it progresses. Keivin has listed many photographs of the fabrication process, especially the construction of the body buck, molds, and actual bodywork. Their most recent work has been on the underbody front diffuser, center tunnels, and rear difusser. or the new Mallen Alley Racing website. Fusion Racing is sharing their progress toward completion of the cars (the new FR-C01 CSR , FR-D01 DSR, and closed cockpit version of the CSR) which they announced in the February 2006 Sports Car magazine buyers' guide, [mentioned in our previous news article]. The intial entry, in their Blooger.com build diary, simply shows laser cut Chromoly tubes for chassis 001 & 002 laid out on the shop floor, organized into sub-section. Fusion will be sharing the layout of tubes in jig, welding of sub-sections, and marrying of sub-sections to form complete chassis. The work along the way will shown for at least chassis #001 and #002 in their shop. Davide Rigon, the nineteen year old Italan F3 driving sensation, and his Gloria B6-S matched the best efforts of Bob Gardner and his Stohr WF1, winning the second race of the Double National race weekend at Pocono International Raceway in Long Pond, Pennsylvania. Both drivers were under Gardner's previous DSR track record by almost 2 seconds. In Saturday's race, Bob Gardner drove his Stohr WR1 to the win, leading Rigon's Gloria B6-S/2005 Suzuki GSXR by 11 seconds at the chaeckered flag. Gardner's best lap time was a 1:33.0 compared to Rigon's 1:33.8 best lap. Peter Frost in his OMS FL1 finished third, followed by Ted Simmons - LeGrand Mk18, Bob Urso - Decker Mk5, Laurence Meisner - Radical, and Bill Gendron - Dragon Sr2. Sunday's race saw Bob Gardner lead the first 6 laps, only to drop out following an oil leak, leaving Rigon to take an unchallenged win. Best lap times on Sunday were 1:33.2 for Rigon, and 1:33.8 for Gardner before he retired. Ted Simmons finished second in his LeGrand Mk18, Bill Gendron improved from Saturday to take third in his Dragon Sr2, and Bob Urso ended in forth piloting his Decker Mk5. Alex Miller was the only CSR competing in the field. So, he took the class win both days. Mathew Direnzo, former DSR stand out, topped the results each day in the S2000 class. Rigon "won last years Formula Azzurra (Gloria F1000) Championship in Italy - National Champion in effect. He got a Minardi test as a prize and is currently doing Italian F3 with Team Corbetta [and is currently third in the championship after winning two races out of the ten to date]. Mr. Glorioso (Gloria), with support from OMP, has put him in the DSR as a prize and hopefully a career builder", reports Phil Creighton who assisiting Gloria to import cars and get established in the USA. "We are supplying [Gloria] with all the resources to try to make the Runoffs in DSR [via] the NE - 3 down and VIR to go. It all ties in with their F1000 program. Originally the plan was to run two cars, the second for Federico Glorioso but time ran out." Gloria Cars of Italy is making strides toward have a strong presents at the 2006 SCCA Runoffs. Raffaele Giammaria guided a Gloria B6-S through two Sport Challange Cup races at the French circuit of Digione. This was a test run in preparation for races in the USA. Phoenix Race Cars, Inc. has announced its newest entry into the highly competitive Sports Racer market. The new car, dubbed the Phoenix SR-07, is the next-generation Sports Racer from the manufacturer based in Phoenix, AZ. Changes to the new car are extensive and are the result of over a year of evaluation and re-engineering, culminating in a car which will be competitive at any level of racing. The car is being made available in two configurations designed for the SCCA Club Racing market. The SRD-07 is ready to enter the SCCA DSR category and comes equipped with an approximately 175hp, race-prepped Suzuki GSX-R1000 engine built by George Dean's Racing Engines. For the CSR crowd, the SRC-07 is available with a 200hp, race-prepped Kawasaki ZX-12R engine also built by George Dean's Racing Engines. A roller, dubbed the SRX-07 can also be made available for those that wish to install their own engine package. "We have put a considerable amount of time in developing the Phoenix SR-07 and we think potential buyers will see the value in the car right away," said General Manager of Phoenix Race Cars, Matt Conrad. "We targeted several aerodynamic and chassis improvements for this car and are very pleased with the results." Major breakthroughs in the car have come in a significant weight reduction, dramatic improvements in the aerodynamics package as well as a minor update to the chassis to improve overall handling characteristics and to also increase rigidity and strength. "Essentially, we've nearly doubled the downforce on the car with only a 10% increase in drag," said Conrad. "Combine that with a stronger, lighter and more rigid chassis and we clearly have a car that will be easily competitive against other brands that are out there at a significantly lower price." A full list of updates and a detailed spec sheet with pricing is coming soon and will be available at www.phoenixracecars.com, or contact Matt Conrad at Phoenix Race Cars, Inc. at 623-581-3222. In response to customer demand, Elan has announced that volume production is now rolling from the company's main factory in Braselton, GA. The company is banking on CSR interest to compliment their orders for the high dollar Lites cars. The all-new-for-2006 IMSA Lites sports car race series received a major boost today when Indy-winning racecar manufacturer Elan Motorsports Technologies announced that their own IMSA Lites contender has moved into volume customer production. There has already been strong customer interest in the Elan Van Diemen DP02 model, (so named after Panoz Motorsports Group and ALMS founder Dr. Don Panoz), as up-and-coming pro race drivers have recognised that IMSA Lites is the best way to showcase their talent in front of American Le Mans Series team bosses, and so grab hold of a rung on the international racing career ladder. And if the new IMSA Lites race series itself has great potential, then the logic of these new Elan customers has been that the Racecar they choose must be the very best package available, at the right price. And that is exactly where the DP02 Sports Racer has caused some highly favourable comment. David Bowes, CEO of Elan Motorsport Technologies Inc., which builds all the cars produced under the Elan, Panoz and Van Diemen brand names, said:- "The DP02 has been a revelation in testing at our nearby Road Atlanta facility - quick, reliable and 'excellent to drive'. Given the amount of the very latest motorsports technology that is packed into this Racecar, and given its strong prospects in IMSA Lites as a winner - plus its nation wide customer base as a sensational SCCA C-SR division contender - I know we are going to be selling a lot of these cars!" Says David Bowes: "Where we really score with teams embarking on the IMSA Lites Series trail is in customer service and at-track engineering capability. Some of our best engineers have been involved in the design and build of these new cars, and they will be at every race with a full support package, along with a full spares service direct from the factory. So whatever the race weekend brings, Elan's engineers and spare parts experts are there to get you back out racing". There is no doubt that everyone at Elan is fired up about this new car and the new IMSA Lites series. The IMSA Lites DP02 delivers the best value - world class engineering and design experience, delivering a race-winning car for America's quickest stars of the future! Read related discussion on the Sports Racer forum. Check for more infor at ElanMotorsports.com. Following an encouraging response to their introduction at the December 2005 PRI Show in Orlando, Gloria Racing Cars decided to make thier cars available in the United States through thier US subsidiary that will be managed by entrepreneur and racing professional Gabriele Pedone. Philip Creighton and his team will also be involved in Gloria's expansion plan as their technical support department. Gloria has applied to IMSA for constructor status for their new B6S Sports [Racer] in their newly launched IMSA Lites 2 Series. While waiting for approval the entire Gloria team is feverishly working in order to be ready for the first race of the season in May. Both the single seater and the sports racer Gloria models will also be available for SCCA racing as soon as the Sports Car Club of America homologation process is completed. "Gloria racing cars were successfully launched in Italy in 2002 by Enrico Glorioso, the entrepreneur who in 1977 founded Sparco and built it to a $63 million business before selling the company to a group of investors. Gloria has been a long time idea of mine, says Enrico Glorioso Founder and President of Gloria s.r.l., and the concept behind it is that I wanted to offer young drivers an affordable way to move up from karting towards professional racingâ€. Gloria is headquartered in Cambiano, an automotive industrial hub near Torino, Italy, in a 15,000sq.ft. state of the art race shop. The Gloria business model effectively blends the rather sophisticated and the simple with great emphasis on cost-effectiveness. The Gloria engineering design calls for a very safe, but lightweight tubular steel chassis powered by a 1000cc motorcycle engine that provides an incredible weight/power ratio. The car meets all FIA regulations and features a carbon fiber nose crash box. The body is all fiberglass and the open wheeler displays anti takeoff devices for additional safety. This innovative formula convinced the Italian Auto Racing Federation to adopt Gloria as its official constructor for the Italian championship: Formula Azzurra Michele Alboreto Trophy." 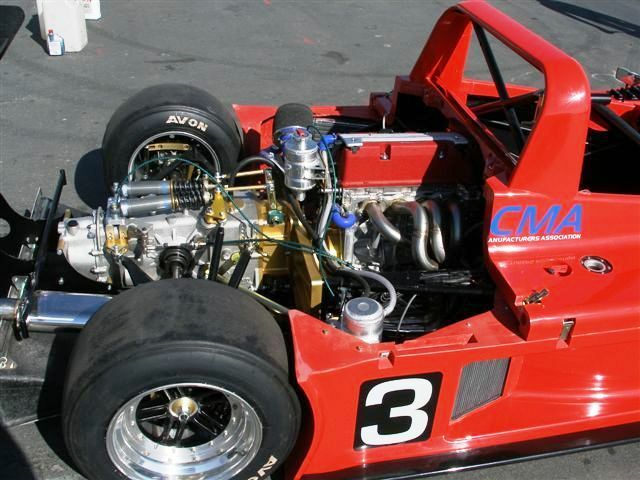 In addition Gloria welcomes and supports the grass-root movement that hopes to create the F1000 class that runs open wheel cars with 1,000cc motorcycle engine such as the Gloria B5. For more details, contact Gabriele Pedone via email gloriacars@aol.com. The February 2006 edition of SportsCar magazine's Buyers Guide lists two new groups who intent to sell sports racers in the U.S. Also, other manufactuers have made changes to their existing or recent offering and are noted. Fusion Racing of Canada and Gloria of Italy both have plans to build and sell sports racers to customers intending to compete in SCCA C and D Sports Racing classes. The new Fusion FR-C01 and FR-D01 will be sold for CSR and DSR respectively. Fusion Racing will also offer a closed cockpit version of the FR-C01, ala mini Daytona Prototype. The Fusion Racing website so far only says, "The revolutionary FSRP-06 will take sports racers on a whole new direction and will be designed to meet the stringent demands of sanctioning bodies like SCCA ASN and FIA.". The new Gloria B65 will be sold for DSR. The Italian manufacturer of open wheel formula cars is trying to branch out into sports racers and is currently seeking a U.S. distributor. 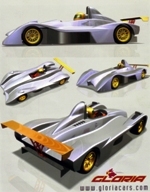 Gloria’s concept of their car was shared with SportsCar (displayed above), but the Gloria website doesn’t show any information on the proposed sports racer. Also shown as revised cars were the ADR, Elan/Van Diemen, Johnston, Phoenix, Stohr, and West. All of these are familiar with those that have follow SCCA sports racing during 2005. The ADR Chassis has developed from the Sport II, to the 1000 (intended for DSR), to the ADR3. Distribution of ADR cars in the U.S. has been taken over by ADR North America and the first ADR3 chassis arrived in California in November, 2005. The ADR3 is designed for CSR and endurance racing using either a Suzuki Hayabusa motorcycle engine, or a 2.0 liter Honda K20A engine. The Elan/Van Diemen looks to be a reworked version of the car that was originally introduced in 2001 as a bodied formula car. The DP-02, for C Sports Racing, is said to be the first new product from the new Elan Motorsport empire. The Johnston SRP-1 first debuted at the December 2003 PRI show. Ownership of the project changed hands along the way but continued to make progress, including development work on the track in 2005. Johnston has already been fielding two cars at the early East Coast National races in 2006. The Phoenix CSR-1 and DSR-1 are the cars that started life as the Merloy, then Maloy. Phoenix Race Cars, Inc. acquired the design and ownership of the cars in 2005 and has continued development. Phoenix also has offered contingency sponsorship in 2005 and 2006 for winning drivers in Phoenix cars. The Stohr WF1 dominated the 2005 DSR National Championship in its first outing at the hands of Mark Jaremko. 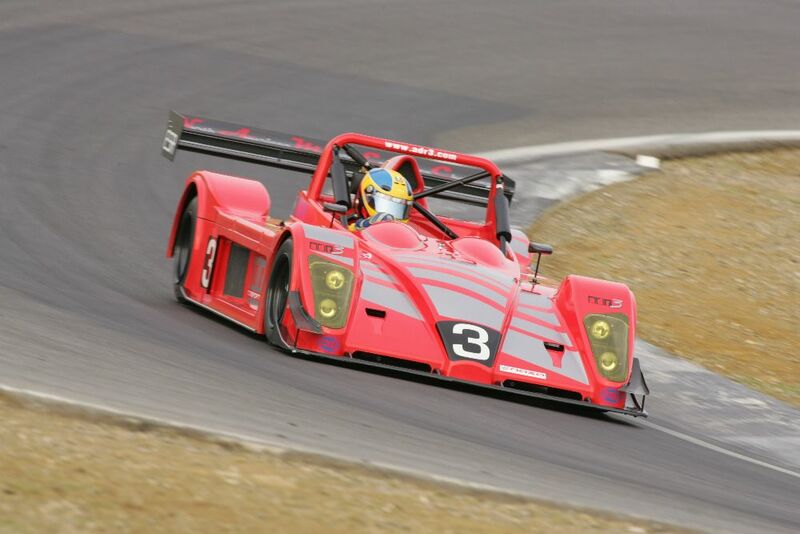 Lee Stohr continues improving upon the Stohr DSR that debuted at the 2001 SCCA Runoffs. The WF1 is the next evolution of Stohr cars for those that want a leading edge design for CSR or DSR. West Race Cars has taken the Stohr DSR and refined it in their own ways to produce the WR1000 and Unlimited for DSR and CSR. West formerly took over the operation of Stohr Racing Cars, and has continued to support existing customers while their own unique version of the previous cars. After improving upon their multi- time Solo 2 National Championship winning Dragon Sr1, Small Fortune Racing Enterprises has announced homologation of their Sr2 for DSR. The semi-monocoque aluminum chassis weighs only 790 pounds dry, while utilizing a dry sumped Suzuki GSXR 1000 engine and Quaife TSD. The newly designed Dragon Sr2 bodywork is formed using vacuum bagged carbon fiber. While the Sr1 was developed over many year via evolutionary changes to an unfinished LeGrand Mk25 (revising suspension, engine, driveline, etc. ), the Sr2 is a complete new creation using SFRE designed chassis, uprights, drive system, and proprietary body design. The suspension design utilizes pull rod front actuation and push rods at the rear. The aerodynamic elements include carbon fiber front splitter, rear underwing, and main wing, all design by SFRE and produced by long time partner Pennon Composites. The Sr2 is built to accommodate a wide range of driver sizes, with features such as a fully adjustable steering mechanism (which adjusts for length, height, and angle) and adjustable pedal cluster. Bill Gendron of SFRE says, "This purpose built single seat car utilizes a semi-monocoque chassis and state of the art aerodynamics giving every driver the edge that is needed for Club Racing, Hillclimb or Solo competition." More information and many photos can be seen on the Dragon Chassis page. Loyning's Engine Service showed the latest version of their Viking CSR conversion kit for the Swift 008 model Formula Atlantic chassis. Photos of a converted 008 appeared on Loyning's new web site. The conversion is very similar to their previous bodywork for the Swift DB4 chassis which was used by Tony Loniewski to win the SCCA's 2004 CSR National Championship. This offering is a kit for customers to convert their own existing Swift chassis. At this point Loyning's is not offering converted cars as rollers or turnkey cars. 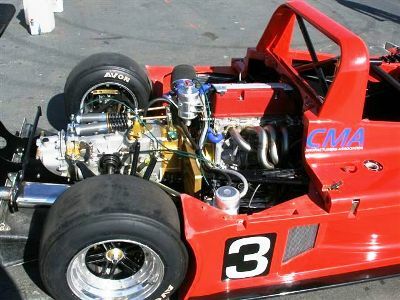 Arnie Loyning continues to offer championship winning engines for Toyota Atlantic, Sports 2000, Formula Ford, GT3, DSR, and CSR. Engines serviced include Cosworth YAC, Yamaha, Suzuki, Corvette, and Spec Miata. Loyning's offers Superflow chassis & engine Dyno's, and race car maintenance. See more details on the Swift Viking Chassis page. Lee Stohr Cars is producing new molds for Lee's newly designed DSR/CSR racer. Some of the parts on for the new design cars may fit the older Stohr cars. Les says, "Last month we built a new 'tunnel' floor mold. John Hill fitted the first floor to his DSR and dominated the Thunderhill Double National last weekend [in California]. He lowered the track record by 2.2 seconds. This was the first time out with the new floor, and with testing it will only get faster." Tunnels are not new this year to the sports racer classes, having been seen on various car at the 2004 SCCA Runoffs. Tunnel were used on Jacek Mucha CSR converted from a Formula Atlantic Ralt, on Loyning's Championship CSR converted from a FA Swift, as well as on John Hill's CSR/DSR Stohr and Bill Maisey's DSR Cheetah. Lee added, "Our floor design is based on the old Group C/ GTP tunnels. Those shapes are in the public domain, and not patented. Some Stohr owners have already built their own tunnel floors. I have a proprietary drawing produced 2 weeks ago which defines my actual floor part. An engineer must define ply number, orientation of fibers, core thickness and density, among many other things. I am not aware of any other DSR manufacturer with such a design or drawing. We have sold 5 of my new floors as of today. For the lap time gain, it is far cheaper than a hot engine. Now that the SCCA has approved ground effect downforce in CSR and DSR, it will be hard to win without it." Coupled with Aurora Motorsports' earlier announcement to import the ADR Sports 2, this now allows them to offer cars for both the CSR and DSR SCCA classes. Aurora Motorsports will strive to have the first customer car ready by June. Potential customers will be glad to know that the Sport 1 chassis and bodies will be built in the United States. The first ADR1000 chassis will be shipping to the US in 2 weeks. Aurora will then update the chassis to SCCA specs (making it a Sport 1), make new chassis jigs, new body plug and molds for the new chassis, and engine mounts. The previously announced Sport 2 CSR cars, with new chassis and bodies, will be ready by late March. They should arrive in the US by mid-April. 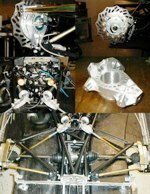 Aurora Motorsports has already procured a 1507cc Hayabusa engine for the first car, and will receive a 2004 1300cc engine this week. The Sport 2 is now FIA crash tested and certified and each car will come with FIA certification papers have FIA tags on the roll cage. 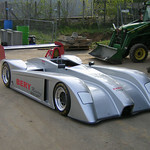 The ADR1000 and Sports 2 sports racers are designed and manufactured by ADR Engineering UK. The ADR cars were featured in the December 2004/January 2005 edition (Issue 57) of Race Tech magazine. Read forum discussion on this topic.